Now that the calendar has turned over to December I can begin addressing the backlog of holiday albums that has been slowly building in my inbox. 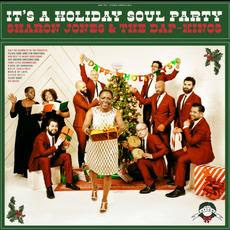 The first is It's a Holiday Soul Party from the always fun Sharon Jones and the Dap-Kings. Unsurprisingly, the record is a fun-filled collection of originals and seasonal standards. You've never really heard a holiday song like "8 Days of Hanukkah". Jones' distinctive deep booming voice singing about a dreidel is really something to behold (behear?). The Dap-King horns take over for the rump-shaking "Funky Little Drummer Boy". Elsewhere the inject some boogie into your "White Christmas". Jones and company are definitely having a hoot as they perform the cheeky "Big Bulbs". If you want something beyond the traditional or something that will be completely different than anything else on your Christmas playlist, then It's a Holiday Soul Party is a great option.